Peru is the first country in the Americas to ban genetically modified foods, putting its food policy closer to that of Europe, than the United States or many of its South American neighbors. 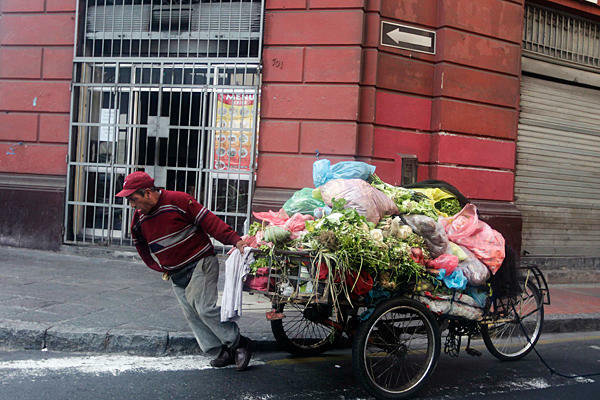 Lima, Peru - There isn't much local Chef Pedro Miguel Schiaffino won't eat. His highly accliamed Amaz restaurant is devoted to finding and using Amazonian food native to the country, like a 600-pound freshwater fish or a little-known fruit nicknamed "cannonball" that tastes like a cross between a guava, coconut, and melon. But a year ago Mr. Schiaffino stopped eating supermarket tomatoes. Even though Peru is the birthplace of the crop, it's difficult to find anything other than hard, pale Roma tomatoes in supermarkets, and Schiaffino says that worried him. "They're a big monoculture, which is why people usually end up using [genetically modified organisms] GMOs. Because when you have monocultures, the crops end up getting diseases, and you have to look for these extreme ways to fix them," he says. Peru was the cradle of the Inca Empire, and today it's home to many crops indigenous to the Americas. It has 400 varieties of potato alone, and a geography that allows farmers to grow almost anything. It's also the only country in the Americas to put a 10-year ban on genetically modified food, with a law that was first introduced in 2011, and went into effect at the end of last year. Its basic intention, say Schiaffino and others, is to protect Peru's biodiversity, as well as the practices that have kept it intact for so long. "In the end, it's not a law that's 'against' anything," says Antonietta Gutierrez, a biologist at Peru's National Agrarian University. "This is a law in favor of biosecurity. The idea is that there should be a responsible way of using technology, so that it helps us develop resources – and at the same time, doesn't destroy what we already have." GMOs are organisms that have been altered via genetic engineering – and this can mean anything from bacteria, to animals, and plants. Supporters praise the ability of engineers to do things like create plants resistant to pests and drought, or ones that have higher yields. Yet those wary of GMO crops worry about food safety, a lack of longterm research, and the potential for contaminating and even wiping out non-GMO species. For the past few decades, Profesor Gutierrez has kept a packed schedule, doing experiments in the test fields and laboratories of the agrarian university, and as a proponent of laws to regulate GMO crops. "There aren't yet long term studies of GMOs," says Gutierrez in a spartan concrete and linoleum lab just outside the capital. "You can't measure their real effects in five, 10, or even 20 years. It takes more time to observe those effects, especially when we're talking about entire ecosystems." Peru's new law puts its food policy closer to that of Europe, than to that of the United States or many of its South American neighbors. While genetically modified species can still be tested in controlled lab settings, as of December 2012, they can't be planted or set free, and GMO seeds are barred from entering the country. Both activists and many scientists consider this a coup. GMOs produced outside the country, however, are still present in products sold in supermarkets. A law requiring products containing GMOs to be labeled was passed in 2011 – but terms and regulations were never set. According to a study done by the Peruvian Association of Consumers and Users, of 13 basic products bought and tested for the presence of GMOs, 10 tested positive. Activists say this is all the start of a long fight. Uldarico Reyes Roldán has been working at the popular Madre Natura natural food market in Lima's Miraflores neighborhood since the store opened 30 years ago. He jokes that a lot of the people who come into the store "want to stay thin," and that if healthy food also happens to be organic and GMO-free, they just see it as an added bonus. "But seriously, for instance, take a look at this," he says, pawing through a wooden cabinet filled with bags of freshly milled grain. He holds up a small sack of coarsely ground wheat the color of tree bark, explaining that it's a Peruvian variety, unaltered, and free of pesticides. "People taste the difference. It's nuttier, more malty. They come back asking for this stuff. Not some stuff that comes from who knows where." Many of these products have been around for centuries—since the Incas, and earlier. "Our ancient cultures knew how to do this," says Schiaffino, the chef. "They grew crops together, in terraces, with the seasons, with the rain, and natural irrigation. I think they had more knowledge about crops and cultivation and farming than we have now." Back in the dining room of Amaz, one of Schiaffino's two restaurants, an enormous mural of a tropical serpent covers the wall behind him. It's done in tiny iridescent beads, meant to evoke the indigenous, plant-based hallucinogen ayahuasca. Schiaffino's restaurants function according to the logic that monoculture and the implementation of GMOs is "going against nature. What nature tells you is that you have to have different plants and different animals around." He relies on small producers and foragers, many of whom are from indigenous groups that have long acted as stewards of Peru's biodiversity. A few of those producers even introduced him to a tomato native to the Amazon. "It's an heirloom seed that's stayed in the Amazon. It looks like a bull's heart, but smaller. Very tasty." Schiaffino says the flavor of a good tomato is all about the smell. "Like some humidity, with earth, along with a green scent. You can tell it's just-picked," he says. "The supermarket tomatoes have no smell. "Sometimes we don't think to appreciate the possibility of doing this another way."